The professional dog training team at Holiday House Pet Resort & Training Center is highly educated in dog behaviors, reinforcement techniques and non-verbal body language. Our team stays current on training certifications and technique by attending the latest conferences, seminars, and even other dog training classes with their own dogs. Jessica has been a zoo keeper at the Brandywine Zoo and the Philadelphia Zoo, caring for a wide variety of animals including meerkats, white rhino, bearded pigs, vampire bats, zebras, and giant anteaters. Her responsibilities included husbandry and training. Jessica was also an assistant marine mammal trainer at the New England Aquarium. She received a B.S. in Psychology from Boston University. Jessica joined Holiday House Pet Resort & Training Center in 2015 as a daycare teacher and dog trainer. She has earned certificates from Outstanding Pet Care Learning Center. At home she spends time with her two young sons, a black Lab-Shar Pei mix, Mason, and her quarter horse Sunny. Sierra joined Holiday House Pet Resort & Training Center as a daycare teacher and dog trainer in 2016. She is a senior at Delaware Valley University studying Biology with a specialization in Zoology. Sierra is also the captain of the DVU Field Hockey team and a member of the Student Athletic Advisory Committee. And when the pups are in the play yard pools, rest assured everyone is safe since Sierra is a certified lifeguard. She loves spending time with her Border Collie-hound mix Ava. Bob is a retired corporate controller and has a B.B.A. degree in accounting from Temple University. After retiring, he started a new chapter in his life and joined Holiday House Pet Resort and Training Center in 2017 as a Daycare teacher. Shortly thereafter, Bob became a dog trainer. He earned a certificate from Outstanding Pet Care Learning Center. Before joining Holiday House, Bob taught Dog Obedience and Canine Good Citizen/Therapy Dog training. He is also an AKC Canine Good Citizen Evaluator. 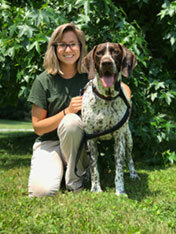 His passion for training dogs comes from training his Golden Retriever, Jackson. 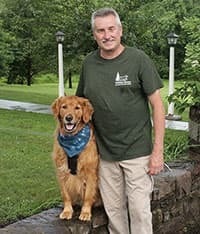 Bob and Jackson work together as a therapy dog/handler team with Therapy Dogs International and have amassed over 1200 volunteer therapy dog visits. In 2015, Bob founded Therapy Dogs International Chapter #294 in Bucks County, PA and holds the Office of Chapter Director. Bob enjoys traveling with his wife and dog. 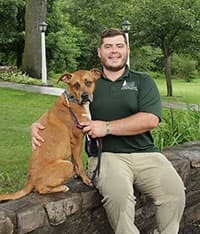 Sean started at the front desk of Holiday House Pet Resort & Training Center in 2015 greeting pet parents and getting to know our guests and Daycare students. 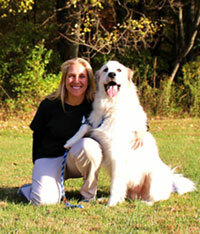 He earned certifications from Outstanding Pet Care Learning Center. 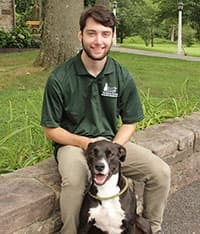 Sean moved to a more active role with the dogs in 2017 as a Daycare teacher and trainer. He enjoys a variety of sports as well as fishing and camping. Even when Sean is home, he is surrounded by pets including his Boxer-hound mix pups Scooby and Lou—who is a service dog—Gypsy a Pomeranian, and the newest member of the family and service-dog-in-training, Jager a German Shepard. And don’t forget his cats Annabelle and Gino. Jack joined Holiday House Pet Resort & Training Center in July 2016 as a Daycare teacher and quickly added training to his responsibilities. He earned certifications from Outstanding Pet Care Learning Center. Jack graduated from West Chester University with a B.S. in Computer Science. He spent 12 years as a competitive swimmer and 4 years as a lifeguard. Jack is certified in CPR and AED. He enjoys hiking and gaming as well as spending time at the beach with family and friends. 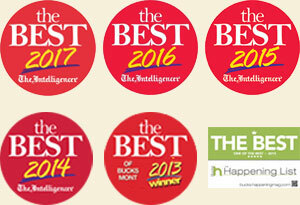 Why do we believe our training methods are better? 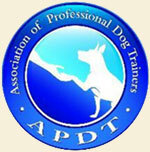 Our trainers are members of the Association of Professional Dog Trainers. The professional training team at Holiday House Pet Resort & Training Center uses positive reinforcement methods for lasting results. Through the 3 “P”s — practice, persistence and patience —most any dog can learn using positive reinforcement. Clear communication fosters confidence and creates a positive relationship. 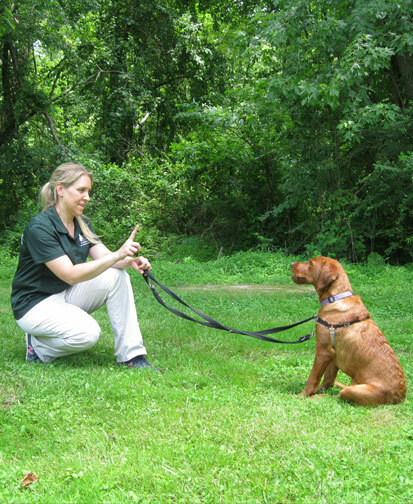 Teaching basic obedience establishes a language your dog can understand and sets expectations for good behavior. No two dogs are the same. To achieve effective training and long-term success, the dog as a whole must be taken into consideration. Breed characteristics, personality, and overall energy level are evaluated in order to tailor a program that will connect with your dog. For example, herding breeds may have a different response to learning certain commands. Puppies may need extra time to learn so breaking down the process into easier steps is helpful. A training program should be designed to fit the dog. It’s not as simple as giving a tasty treat when the dog does something good. Training should be physically and mentally engaging for the dog. Giving the dog the ability to think and problem solve are key elements to effective learning. Positive reinforcement training is about teamwork and clear, consistent communication.